Despite not participating, I've read quite a few threads here over the years. I respect this forum for it's wealth of information, it's just not very welcoming to new members (look how I was greeted) due to certain aggressive and paranoid individuals. I'm sure Eric is fine with the state of the forum, and there's nothing wrong with that. Not all forums actively seek out and welcome new members. I understand wanting a more focused and no-nonsense discussion board. It's just not for me. I'll keep watching and supporting Eric's work regardless. I hope to hear more interviews from you, Eric. Take care. icecap wrote: ...it's just not very welcoming to new members (look how I was greeted) due to certain aggressive and paranoid individuals [i.e., Mark Wilson]. Moses put a veil over his face to mitigate the brilliance of his righteous countenance after one of those chats with the lord of Bible Babylon. You might consider giving it a try in the future when reaching out to the rabble like myself. Probably a guy that finally overcomes his disgust for a "flat earth forum...[where] none exist," and chooses nonetheless to finally comment at IFERS, and coming to the defense of another guy who "has no argument for the globe model, but still thinks the earth being flat is crazy," should consider attending the Logan Paul School of Fence Riding to fine tune his hypocrisy (as a bonus he'll show you how to get "gravity" working in your favor when dropping microphones during the now annual Toxic Twins' Shillfests). You're not new here since you've been silently observing, we are to believe, for many months and knew what to expect when standing in another's stead and yet choosing to defend a flimflam man having no logical argument for "the globe model, but still thinks the earth being flat is crazy." All those months biding your time until overcoming your own self-righteousness to deign comment, and you belly-flop right out of the gate. Walking it back was the only viable option. I've only just stumbled across all of this amazing Flat earth information in the last month or two and I'm still in the experimental phase, but I'm leaning very heavily toward the Earth being flat and stationary as Eric describes. Generally, most of the questions that are raised in my observations have been sufficiently answered with this model, and hopefully the following couple can also be satisfactorily explained. Currently in the Southern Hemisphere, it seems that the sun casts a shadow in the early morning and late evening (sunrise and sunset) in the opposite direction (north) to that which it casts in the middle of the day (south). Essentially, it covers an arc beyond 180 degrees. As far as I can tell, the Flat Earth model (definitely) and the Heliocentric model (possibly) prohibit the shadow's arc from exceeding 180 degrees throughout the day, although possibly in the middle of summer at a distance near the tropic of Capricorn coupled with the 23.5 degree tilt it may be possible with the Heliocentric model. Is there some way the Flat Earth model can account for this? The phases of the moon seem to have a direct relationship with the relative position of the sun. Now I understand why it is said that the moon generates its own light, and definitely agree that a disc is the most likely shape of the moon, but why would the moon only generate light on the side adjacent to the sun if there is no relationship between the moon phases and the position of the sun? In conspiracy circles it is often said that there are no such thing as coincidences, therefore there must be a reason for this? That's all I have at the moment. It's great to be here discussing this most interesting subject. "Drive a stake into the ground in such a position as to expose it to the sun for the greater part of a day - the whole day if possible. Mark the end of the shadow every quarter of an hour, and you will find that the marks form part of an elongated curve, clearly proving that the sun moves over a stationary earth." Lunar eclipse - a selenelion occurs when both the Sun and the eclipsed Moon can be observed at the same time in the sky. Thanks for the quick reply, but neither response really addresses my questions. Even if I mark the shadow every quarter of an hour throughout the day there is no explanation for why the angles the shadow cast from sunrise to sunset should exceed a range of 180 degrees. The fact that yin-yang proves the earth is stationary is not in dispute, just the path that the sun is taking. I apologise if I'm missing something in the video that explains this. At sunrise this morning for example, the sun rose slightly in the south-east, casting a shadow slightly to the north-west. The angle produced in comparison to a straight east-west line was probably -10 degrees. Throughout the vast majority of the day however, the sun will be slightly to the north, casting various shadows slightly to the south with angles ranging from 10 to 170 degrees. Tonight, the sun will set slightly in the south-west, casting a shadow slightly to the north-east. The angle will be around 190 degrees. The total range of angles cast is 200 degrees. This can't happen if the sun is always situated slightly to the north as the flat earth model, and indeed the heliocentric model, suggests. The moon phases question has nothing to do with the new moon and eclipses. The earth casting a shadow on the moon is not the reason for the moon phases, which is what I'm talking about. The phases of the moon still occur regardless of where the Earth lies, so suggesting that because the Earth isn't blocking the moon during a lunar eclipse somehow addresses moon phases is incorrect. This morning the moon was showing it's last quarter. The sun was trailing the moon by about 6hrs and the half lit up from our perspective was the side nearest the sun. In two weeks time, the opposite will be the case. The sun will be leading the moon by about 6hrs and the half lit up from our perspective will still be the side nearest the sun, the first quarter. If the moon shines independently of the sun, then why does the other half of the moon not shine in these circumstances? If anything, the fact that the sun is on the opposite side, should mean that the moon is brighter on that half as it doesn't have to contend with the light from the sun. Hopefully, I've made clear what point I'm trying to make. Believe me, I want there to be a satisfactory answer. I'm not trying to disprove the flat earth model. It may be that we just don't have an answer for this at the moment and that's fine, but we're here to investigate and find answers. rotor wrote: Currently in the Southern Hemisphere, it seems that the sun casts a shadow in the early morning and late evening (sunrise and sunset) in the opposite direction (north) to that which it casts in the middle of the day (south). In Africa, a viewer either at the north or south side of the red line, would see a generally east/west sunrise/sunset, correct? But depending on the viewer's perspective from his location, north/south of the line, the noonday sun either passes to the south of him, or to the north. A viewer at the extreme north of Africa sees a southeast, southwest sun. A viewer at the extreme south of Africa sees a northeast, northwest sun. In your estimation, is this not a replication of what is going on prompting your question? The Moon along with Mercury and Venus show phases; they look to be self-illuminated; and their location to the Sun may be what triggers these phase changes. rotor wrote: Even if I mark the shadow every quarter of an hour throughout the day there is no explanation for why the angles the shadow cast from sunrise to sunset should exceed a range of 180 degrees. "Mark[ing] the shadow every quarter of an hour throughout the day" is what sundials do, correct? Do sundial shadows work, marking out the hours of the day wherever placed on Earth? In other words, if sundials work wherever placed, then your understanding of shadows would need to correspond with the demonstrable facts in nature that, 1) sundial shadows don't lie, and 2) those shadows must be doing what you're asking about, no matter where on earth the sundial is. Thanks Mark - Illustrations definitely make it easier to explain. I suppose what I'm saying is, pretend you were situated in South Africa (below the red line). Wouldn't you expect your shadow to always be to the south of you and never to the north? The sun is always north of your location so how can the shadow ever been cast to the north of you? At noon, the logic is fine, but at sunrise and sunset it's not the case and I think it should be. To put it plainly, how can the sun rise and set south of you (living in South Africa) if the red line is well north of you as is the midday sun? Regarding sundials - Your two points are correct - The sundials show shadows in their correct position, and the shadows are doing what they do. However, the theory of where the sun passes overhead is the sticking point. If it rises to the south of me, travels to the north and remains there throughout the day and eventually makes it's way back down south by sunset (which it does), then either/and/or it travels much further south than the tropic of Capricorn, it doesn't work it's way out from the north pole in concentric circles, some other force is acting upon the sun at least in the southern latitudes, or some other combination of all or none of these things and something else is the explanation. Correct? The majority of Africa is north of the Tropic of Cancer, the Sun travels between the two Tropics. You've stated, that in Africa when an object is south of the Tropic of Cancer, and lit by the Sun, shadows are cast to the North. Please provide evidence for this statement? That's exactly what I'm saying. Assuming I can prove it to you, you'd find that strange, right? Welcome to the club. Presumably the same conditions may apply in the northern hemisphere, but I don't live there so can't know for sure. I'll see if I can take a photo or something. Stay tuned. Agree with Schpankme, rotor. And like him I'm curious what evidence you have, or are you now, or have you been, in such a location to observe such a phenomenon? Where do you believe the source of light is that is causing the northward facing shadow? My contention would be that if a sundial works on the southern tip of Africa (it does), then there can be no such anomaly as described. Your evidence can't include anything produced by Anthony Powell (Antarctica; A Year On Ice) if your assertion includes a 24 hour sun in Antarctica. rotor, this may be premature since you haven't answered my question yet, but since I mentioned Powell above I provide the below video for consideration by anybody who may try and make the claim that Powell's stuff is legit. His stuff is legit in the documentary Antarctica; A Year on Ice. But they do not try and claim a 24 hour sun in that documentary. They knew better than to try that. And the documentary shows beautiful time-lapse footage of the sun sweeping by Powell's position parallel to the Earth. The falsely claimed 24 hour sun from Antarctica comes up from time to time, so it can't hurt to have a marker to it here. markwilson wrote: rotor, this may be premature since you haven't answered my question yet, but since I mentioned Powell above I provide the below video for consideration by anybody who may try and make the claim that Powell's stuff is legit. Thanks Mark - I'll take a look at that. In regards to proof, I plan to take a series of photos throughout the day of the same vertical item (such as a pole) and show that the shadow occupies angles ranging beyond 180 degrees. I live in Melbourne, Australia, by the way, not South Africa, I just wanted to demonstrate my point using a location clearly visible on the gif you provided. The sun exhibits this same behaviour every day here, so shouldn't be too long before I'm able to take the relevant series of photos. Ok - So I have the photos now. I used a lamp post in the street to demonstrate the different positions of the shadow throughout the day and they cover around 230 degrees of arc. Here are the pictures. I have other pictures from different times of the day but the upload function has resticted me to three at a time. These three demonstrate the facts though. One is at noon yesterday showing the shadow cast pretty much due South as you'd expect. One is at 8pm last night showing the shadow cast north-east and the sun is visible in the south-west. One is this morning at 8am showing the shadow cast almost due west but slightly to the north meaning the sun is slight south of due east. As far as I can gather, the flat earth model of the sun circling the north pole does not allow for this to occur. Can we come at with a plausible explanation of how this is able to happen? Whilst undertaking this little experiment over the last few days, I've stumbled across a much more serious issue with the FE model. Now it requires further investigation, but it seems the entire night sky follows two different and distinct cycles that also don't seem to be explained with the current model. Now, correct me if I have this wrong, but the FE model suggests all of the night sky rotates around the north star and occupies the same position at the same time each night, correct? If that is true, then why is Orions belt not visible in the June solstice but visible in the December solstice? If however, the night sky only rotates around polaris on a yearly basis then why aren't the constellations visible in the same position throughout the night? Either way it seems only one cycle is accounted for and not both (daily cycle and annual cycle) if the FE model dictating that the Earth doesn't spin or orbit the sun is correct. Now don't get me wrong. I want to disprove the heliocentric model and embrace flat earth science, but these questions are starting to worry me. I just want to make sure the theory is sound before investing myself too heavily in it. It would be great if Eric could chime in with suitable explanations to overcome these concerns of mine. What other Model would you "embrace" if not the flat Earth? Is water always flat on some other Model? rotor wrote: ...if the FE model dictating that the Earth doesn't spin or orbit the sun is correct. 1) FE is not a model "dictating" anything. Demonstrable facts in nature dictate to us proofs of our reality. We're not in a model, nor do we hold forth a laughably phony model like the Heliocentric Masonic Priest Class must do. 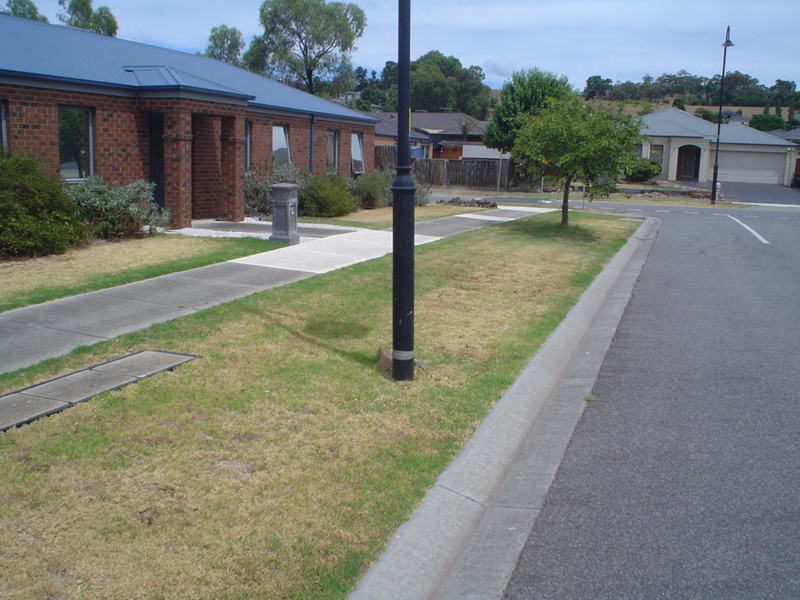 And if you place a shorter stick in the ground next to the light pole, mark the shadow tips throughout the day every 30 or so minutes, the tips form an elongated curved line around your light pole and/or stick. 2) All evidence conclusively proves the Earth stationary. No spin, no orbit. 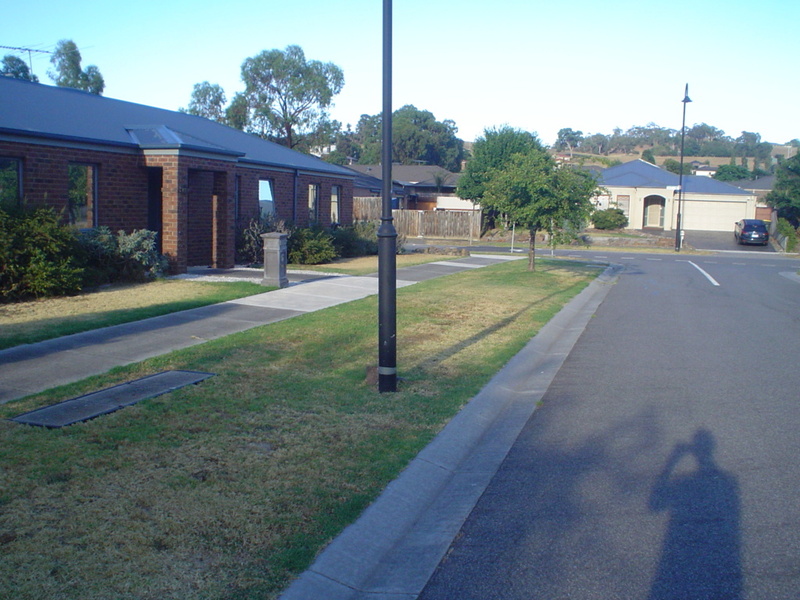 3) Your pictures show a street light as a sundial. The sundial works. The sun circles the stationary plane parallel to the plane. rotor wrote: Ok - So I have the photos now. Can you explain the meta data time stamps on your photos? Should the timestamps match an expected morning/noon/evening sequence? If the 1st photo is at 12:00, and the last at 24:00, twelve hours apart, doesn't it make sense that the middle shot would be at about 18:00? I see what I did. The pictures, top to bottom, were snapped in sequence 2, 1, 3, with midday on the 27th (picture 2), evening on the 27th (picture 1), and then the next morning on the 28th (picture 3). The time-frames, in order taken, are on the 27th at 12:29, then 19:56, and finally at 07:57 the morning of the 28th. Here are the readings from Melbourne, taken from https://susdesign.com/sunangle/. In standard day sequence, though the last one was taken the following morning: morning (3rd pic), midday (2nd pic), and evening (1st pic). 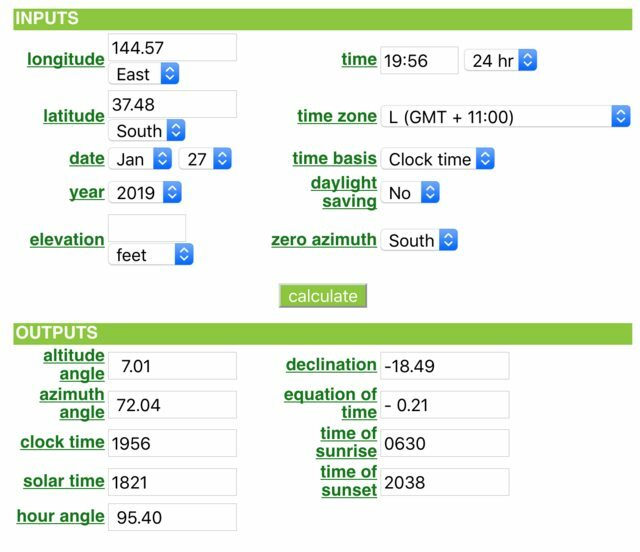 Regarding the azimuth angle, we find this at the above solar panel calculator: "The azimuth angle is measured clockwise from the zero azimuth. 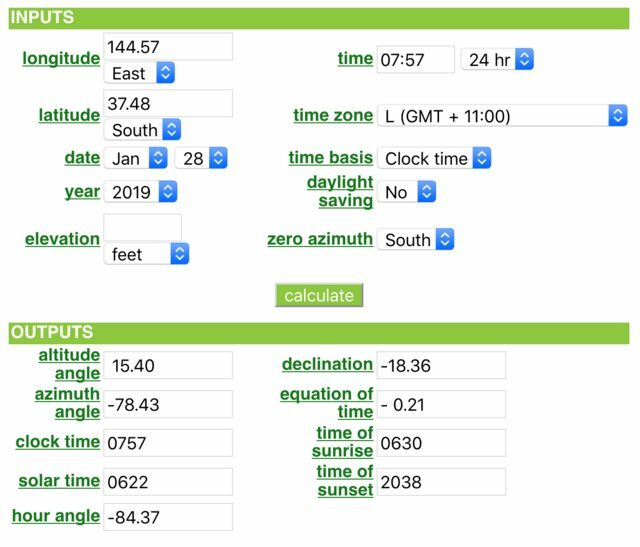 For example, if you're in the Northern Hemisphere and the zero azimuth is set to South, the azimuth angle value will be negative before solar noon, and positive after solar noon." SOMEBODY CORRECT ME IF I'M WRONG. THE AZIMUTH ANGLE IN ROTOR'S PICS HAVE TWO ON ONE SIDE OF SOLAR NOON (NEGATIVE OR POSITIVE NUMBERS BASED ON THE "ZERO AZIMUTH" ASSIGNED), AND ONE ON THE OTHER SIDE OF SOLAR NOON (NEGATIVE OR POSITIVE NUMBER, AGAIN BASED ON THE "ZERO AZIMUTH" ASSIGNED). Obviously, and looking at the altitude angle sequence of the pics predicated on the time of day they were taken, the sun begins low on his horizon in the northeast (15.40 degrees), is at 66.30 degrees to the north during the midday pic, and then is low again in the northwest when setting on the horizon (7.01 degrees). 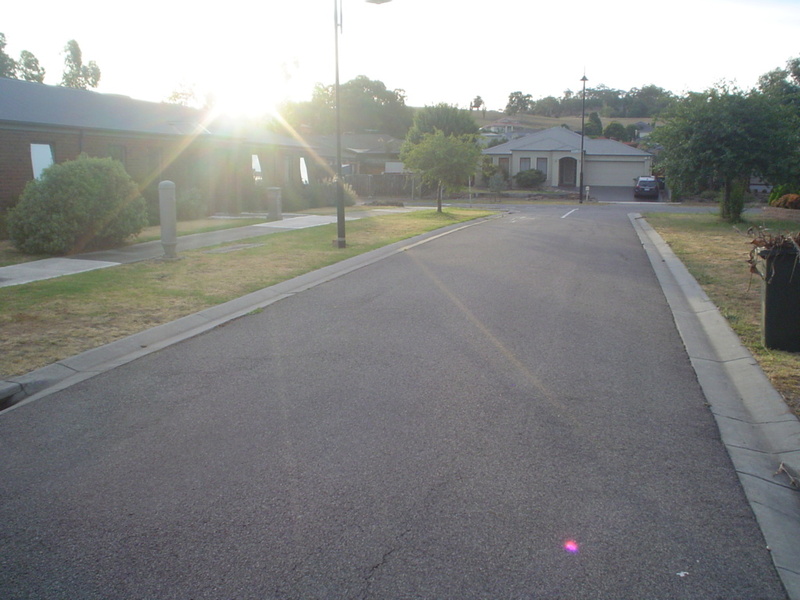 In such case there could never be an occurrence of a shadow facing north, since the sun (the only source of light causing shadows) is always north of his position in Melbourne, Australia. Even if I mark the shadow every quarter of an hour throughout the day there is no explanation for why the angles the shadow cast from sunrise to sunset should exceed a range of 180 degrees. The range of shadow of the sundial, or stick in the ground, traces the sun's circumpolar movement; a great sweeping arc. The shadow tips clearly paint an elongated curve. The length of shadows vary dependent upon geographic location relative to the source of light that is circling the North Pole. It's ever-moving, the shadows ever-changing. If you are geographically located far enough north during Midnight sun (while sun is at Tropic of Cancer), and place a stick in the ground, it's guaranteed the shadow cast will "exceed a range of 180 degrees." In such case the range of shadow is 360 degrees since the viewer is located far enough north to see the sun circle himself without setting. The sun never sets during the midnight sun phenomenon, but only in the north, and only to those geographically located in those positions to see it relative to the sun's position while circling in the sky. There is no concomitant 24 hour sun in the south. So anybody well south of the southern tropic making the case for northward facing shadows has some 'splaining to do. You stated, "Currently in the Southern Hemisphere, it seems that the sun casts a shadow in the early morning and late evening (sunrise and sunset) in the opposite direction (north) to that which it casts in the middle of the day (south)." Impossible. Sun sweeps by to the north of your position, which is well south of the southern tropic. And unlike the midnight sun phenomenon, in which the shadow is 360 degrees, your sun certainly isn't jumping back and forth, one side to the other, of your pole/stick placed in the ground south of the sun's movement passing by you to the north. The sun is only ever to the NORTH of you. You claim to be in Melbourne, 37°48'50.4" latitude. The Tropic of Capricorn is at 23°26′12.5,″. You're some 14 degrees south of the sun's passing you by when at the December solstice. It's even further north of you now. Since there are roughly 69 miles between latitude lines, you're some 966 miles from the sun when it is at the Tropic at the December solstice. It's roughly 38 days since December solstice. Assuming the sun contracts from its largest circumference roughly 18.4 miles per day to June solstice, circumference getting smaller day by day, that means we need to add roughly another 699 miles to the distance the sun presently is north of you; or 966 miles, plus 699 miles, means the sun is roughly 1,665 miles north of your location! Why are you claiming northward facing shadows in Melbourne?! Note: I'll post my computations below for finding rough speed, distances, and the position of the sun presently, so my figures can be disputed if necessary. 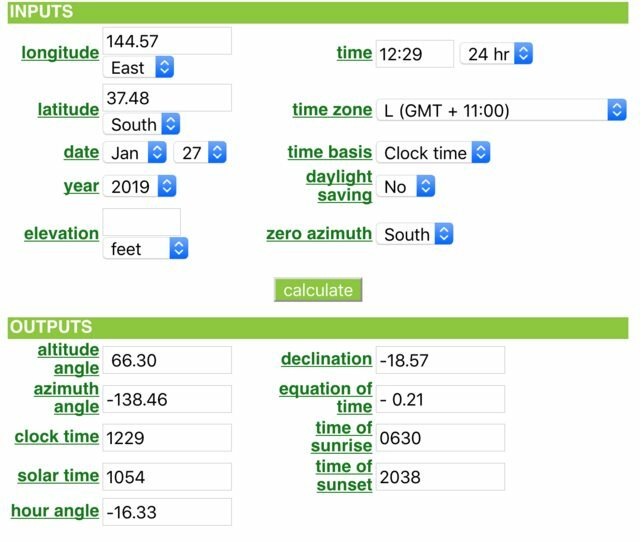 I've posted this elsewhere on IFERS but do so now so rotor can see where my calculation for the present rough distance to the sun north of his position in Melbourne derives. The sun travels from solstice to solstice, 24 degrees (rounded for simplicity’s sake) either side of the Equator. Therefore the sun, when at the equator during an equinox, is 90 degrees from the north center point, or stated in “global” parlance, 0 degrees latitude. However, a flat earther’s point of reference would be 0 degrees at the north center point (the Center of the earth), with latitude lines stepping out 69 miles per line around that center point, if indeed each latitude line is correctly figured based on the pretended “globe” size of 24,901 miles. Sixty-nine miles between latitude lines. a diameter of 9,108 miles. a diameter of 12,420 miles. a diameter of 15,732 miles. 24 degree N latitude line circumference: 28,614 miles. Equatorial latitude line circumference: 39,019 miles. 24 degree S latitude line circumference: 49,423 miles. We find that the sun travels at a variable speed, in the same 24 hours daily throughout the year— and going much faster at the southern Tropic, with its much larger circumference, than at the northern Tropic, with its much smaller circumference. With the above information, we can get the rough estimate of the incremental daily speed change of the sun every 6 months as he expands/contracts between the two Tropics yearly. 867 mph, divided by 180 days (roughly the 6 months between solstices), equals 4.8 mph the sun accelerates/decelerates daily, in each 6 month period, as it faithfully marks out the 24 hour days we experience. FINALLY, and with the above information, we can ascertain the rough change in miles the sun’s circumpolar path expands/contracts daily as it circles the North Pole. At the southern Tropic of Capricorn the radius is: 7,866 miles. At the northern Tropic of Cancer the radius is: 4,554 miles. Mark, your dissection of the hoax was very well done.